Discussion in 'Effects, Pedals, Strings & Things' started by Tito83, Oct 9, 2008. So what's your favorite S/S/H combo for a strat? I'm really struggling with my bridge single and I just can't get a good balanced tone for all three singles. I'm getting a humbucker for the bridge and I need some inspiration . I'm using a full size SD Pearly Gates bridge and Fralin single coils with 250k pots. Didn't you post this same thread awile back? That's a beautiful strat, Bonenut. I've had best luck with SD Ant. Surfers for N/M and the Tex Hot for bridge (for singles). As for the HB, I really like the Custom 5 HB in the bridge. I had a JB in that same strat for a time and it didn't match up at all. No clarity and one dimesional - all midrange and muddy. I've prefer lower output pickups like the PG, Antiquity, etc. stratman, I don't have a problem with the hum (especially 'cause I'm using JS free noise pickups ). The thing is that I have a hard time getting a good tone that works equaly well for the bridge and neck single pickups. It was like that all SSS guitars I had... So I'm giving up and joining the Landau club. Bonenut, yes I did...Sorta. I asked if someone could give me a help to choose a combination of pickups that would fit my needs... The thing is I got no answers, so I thought about asking about SSH configs people like so I could have a few ideas. Now that I've mentioned it... I have a Suhr with maple neck/rosewood and alder body and I'd like pickups with really good clarity/string separation and tight low end. The bridge humbucker should sound as a HB but still be balanced tone wise with the other 2 pickups. Ideas ? I like my kinman traditionals + Seymour Duncan Alnico II pro bridge HB a lot. Nice balance, realy versatile and silent! assuming you have a swimming pool route or the bridge routed for the humbucker, the main thing to worry about is shielding and quiet wiring for the setup. If you have a suhr I would recommend sending it back to suhr and having them retrofit the SSC and they can wire up a great splittable hum in the bridge, I like the SSV. I like v60s in the middle and neck too. And your whole rig will be dead quiet. Cheaper than getting another worthy guitar and you have a fantastic gig rig that is never loud because of lights, dirty power, whatever. I could never quite find a use for the standard Strat bridge pickup. I have an SD HotRails in mine with a coil tap so I can still capture some of the strat quack. Also have an SD CoolRails in the middle position, but it's always tapped so it's irrelevant. 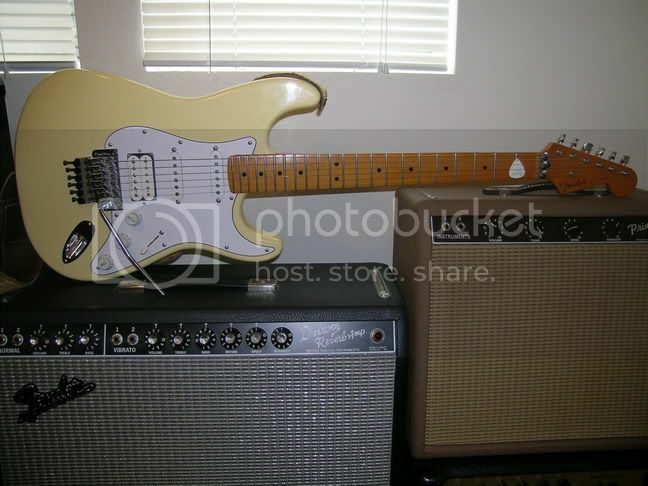 Then there's the other Strat . . . which will never be modded at all. And probably never played. i've got a JB Jr in my '83 strat. it's a whole lot better than the single coil i had in there (Fat 50s). And it pairs nicely with the custom shop 69 and fat 50's i've got in the neck and middle, respectively. i also have a blender pot in the 2nd tone position, so i can roll a little neck into the bridge-only position. No experience with the "full size" JB, but the Pearly Gates sounds great in my epi LP Jr.
No pool, but it's routed H-S-H I think, just checked the bridge position. I won't send it for a number of reasons... The main one is that I live in another continent and it would be a lot of hassle and money for a pickup change. Another reason would be that it's a standard - in a very straty fashion, but still a standard, and it can't be retrofited with the SSC system (read it somewhere on JS's website). I just head the Pearly Gates and Alnico II samples on the SD site and I think I like the Alnico II better, sound's tighter I think. Here is something I had Suhr make for me. It has Suhr SSV humbuckers in the bridge and middle. I get a fat, clear bridge sound, a fat quack sound, a good neck bucker sound out of the middle with the tone control rolled back a bit, and the traditional Strat neck tone---all noiseless. The neck single is a JS noiseless, and I love it. The output of the single is the same as the buckers---no volume drop. The only position I really love on a Strat (and it is the strength of the guitar, IMO) is the neck. I get that with this guitar, plus the great humbucker tones. BTW, the body is made of mahogany for a richer sound all around. This is a true Superstrat style guitar as it does Strat and Gibson equally well. Kinman Woodstocks and a Duncan 59' in my main Strat for the last few years, have been quite happy with it. At the moment I've got a GFS "Lil Killer" bridge position paired with Seymour duncan antiquities mid and neck in a 70's re-issue strat. The $29 pickup off ebay is jaw dropping. For the money I don't think it can be beat. The GFS Sustains well & its not tinny sounding at all and most important its very well balanced with the Duncans volume wise. Prior to the GFS swap I was using a DiMarzio Fast Track II. I found out over time every diMarzio I've used sounds over compressed and scooped as if your listening to sound through a 2" PVC Tube, this became more evident to me when using a diMarzio/duncan combo, just differnt sounding. Duncan Jazz neck model. It was designed to be used with 250k pots and balances perfectly with single coils output and frequency wise. Sounds great as a bridge pickup. And despite basing the recommendation on experience, it is the pickup that Seymour himself apparently says is best for an HSS setup with vintage output single coils.